If you're looking for a four-door sedan with responsive driving characteristics, a lot of features and an attractive price, the 2009 Kia Optima should be on your shopping list. It's handsome, offers impressive safety features and represents a good value for the money. This is an stylish reliable vehicle that will stay with you for years! 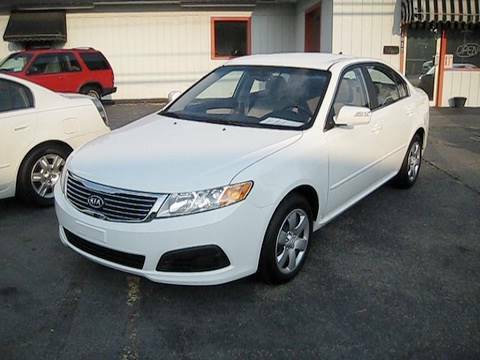 I have owned my Kia Optima for 9 years and have had no problems. I do keep up with the required maintenance. It gets great gas mileage and is powerful for a mid size sedan. I also love the fact that when I am low on gas the little indicator light comes on but I still do not have to worry about finding a gas station right away:) other people who have driven my Kia comment on the power. Very comfortable to drive. Even though the car is 9 years old it still looks stylish. I like the large size of the trunk even though the interior is large enough for all passengers to sit comfortably. Kia optima; all about the space. I have one complaint about my car and that it does not have ac vents in the back seat. Other than that I love my car! It is great for a first time buyer and or young driver. I am a craft vendor and I can fit three tables(collapsible of course), two medium size plastic containers, a 10x10 tent and some weights all in the trunk! So plenty of space. With that being said I travel a lot and with this car you can easily make a 300 mi trip on a full tank. I am a small person just under 5ft and I can easily adjust not only my seat but the pedals to my fit. Over all I am happy with my Kia! Car has been great. Parts are easily found and fairly simple to install making maintenance a breeze. Very good layout under the hood; the engine compartment could be more easily accessible, but that is more of a personal preference. I have owned the car since 2015 and since then I have put over 60, 000 miles on in driving all over Texas and it is held up quite nicely. Sitting pretty at 108, 000 miles and still going strong. About to have to do a good bit of maintenance on her soon but that is to be expected with a car that is been on the road for 10 model years.